People ask us if we miss the seminary life. No, not really. We miss our friends there, obviously–but we’re so close we can have them over for meals (in a proper dining room, huzzah!) or get together for tea or meet up at a park if we want to. Admittedly, we haven’t done much of that yet, but that’s more due to the fact that we’ve had house guests off and on for the last three weeks than anything else. The girls and I have started our Thursday classes–they take Latin and Science in the mornings while I get writing done, and then I teach American Lit, then we have lunch and come home. It’s been marvelous. Not only are they getting a fun class experience and I am getting two straight hours of writing time out of it, I’ve discovered that I’m actually pretty good at teaching! Or, as Grace put it: “Your first class was really boring, Mom, but all of them after that have been a lot of fun.” What can I say, it took me that first class to figure out what I was doing. We finished reading Johnny Tremain this past week and will be starting The Sign of the Beaver after break. The kids are all in agreement that parts of JT were interesting, but it started out too slow and none of them feel like reading it again for fun–“Not like the Harry Potter books,” one student said. (“Actually, I think Harry Potter is kind of boring,” said Joy. “But I might like them when I’m a little bit older,” she generously admitted.) I loved having conversations with them about the book and their impressions of it, and especially loved their responses to some of the assignments (the letters they wrote from book characters to someone outside the city about the events of the Boston Tea Party were hysterical). As for the writing, that’s proceeding at a snail’s pace (when does it ever not? ), but it does progress. I finished the major rewrite of Candles in the Dark (remember that? Remember the novella I was supposed to publish in June? Hahahahasob it’s coming, I promise) this past Thursday, sent it to my betas, and am now trying to figure out if I should start editing the short story collection I was supposed to publish in July (guys, I am SO BAD at deadlines) or get back to the next Whitney & Davies novel, which I had optimistically hoped to publish in September. I think I need to stop planning on getting projects finished in the summer. This was BEFORE Daddy said “We’re nearly at the top!” for the fifth time and Mommy threatened to push him off the edge. Our year of rest is still off to a good start. When our kids were really little – like, baby and toddler – I spoke loftily about how they would always share a room, how even if we lived in a place where they could have their own bedrooms they wouldn’t, that learning to compromise and share and work with another person was so important, and that sharing created a special bond between siblings even if they hated it sometimes. Then, when they were about five and three and we were living in a house with four bedroom, I found myself putting them in separate rooms. Gracie had started a habit of whispering to her sister half the night, and Joy was getting cranky and miserable from never having a place to go where her sister couldn’t follow. 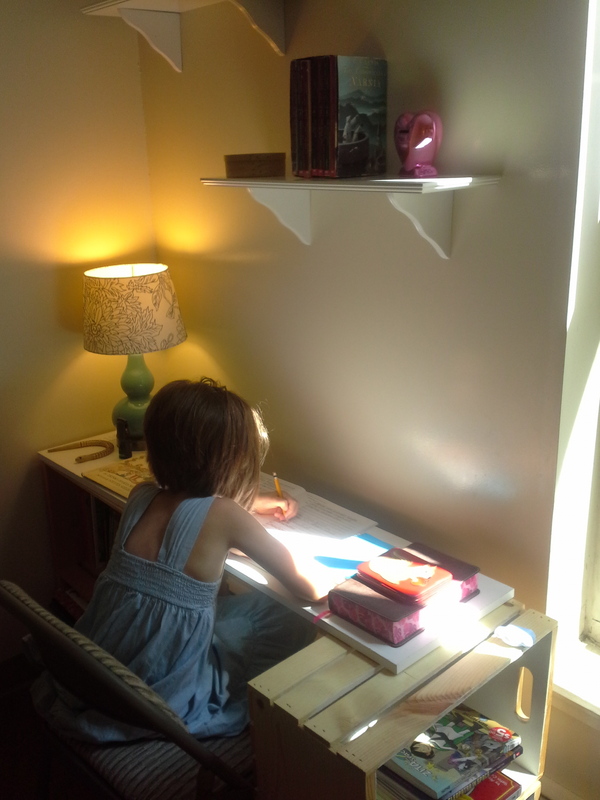 The guest room was transformed into Joy’s room, and life became much happier for everyone. Now we’re in a two-bedroom apartment, and not-sharing is not an option, though at this point all of us wish it was. Joy is deeply introverted and high sensitive, and is reaching the stage of wanting her space to be neat, tidy, organized, and open. Grace is a chatterbox with no sense of boundaries, and still likes everything she owns to be out all the time, scattered everywhere. Things get tense. While we can’t give them their own room – and safety rules on campus mean we can’t even let Joy go outside to play by herself – Carl and I did put our heads together to come up with a plan for making life a little better for them. 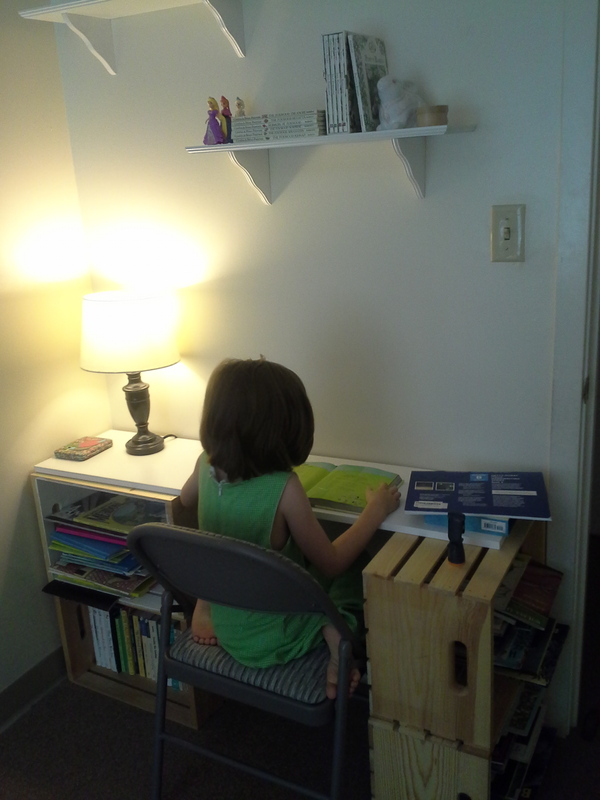 We cleared out probably half their toys and even some books (weep) and rearranged their room to be able to give them each their own desk, on opposite sides of the room. The desk is each girl’s own space, which the other one is not allowed to touch without permission. Eventually I plan to rearrange the books left in the crates so that the ones that are more Joy’s interest are with her desk, and the same with Gracie. 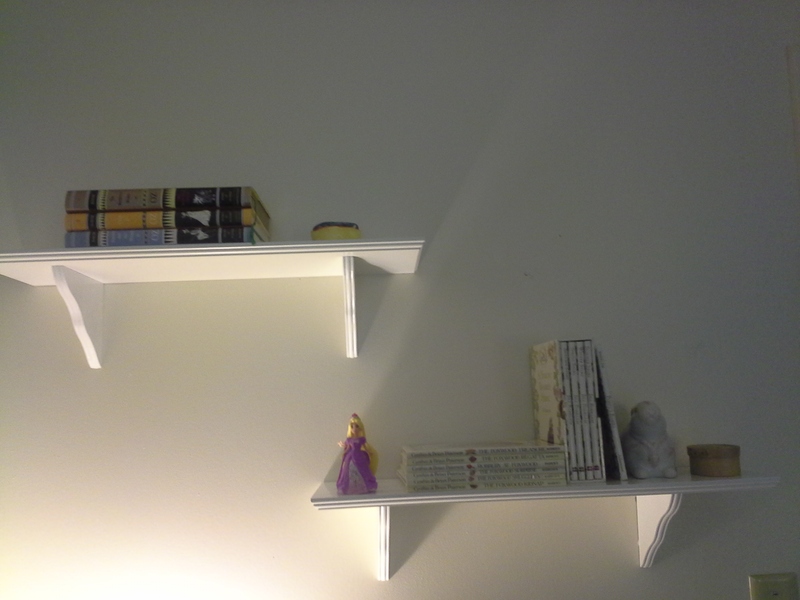 Above each desk are two shelves, also for that girl alone, for trinkets and special things. And books, of course. 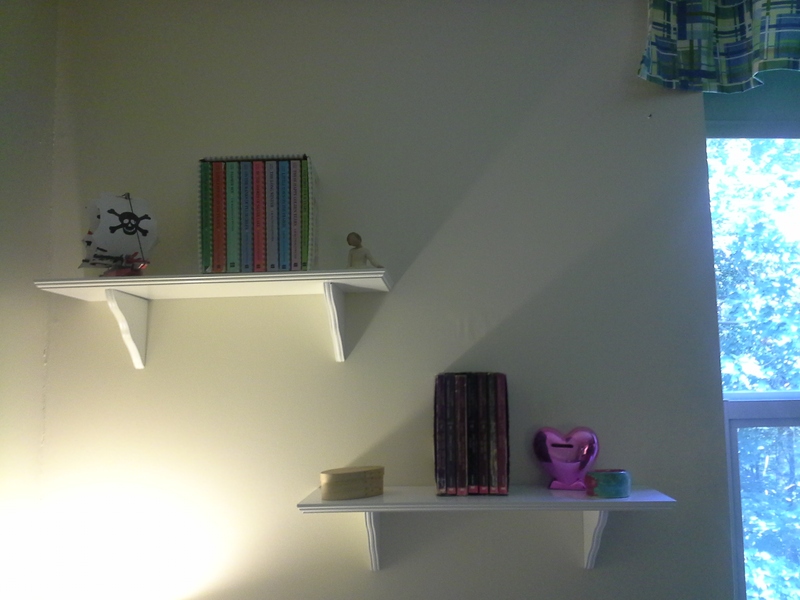 The shelves transform the feel of the entire room; I love them so much! We also bought some rolling carts with drawers, and shallow boxes to go under the bed, and are in the process of organizing their remaining toys so that they are clearly labeled and separated. I’m also thinking of some decorating improvements – new curtains, maybe even an area rug to go over the nasty brown carpet everywhere in the apartment. It’s not a perfect solution, but what ever is? It’s better than it was, and that’s enough for now. Hopefully, when the girls look back on their years here while Dad was in seminary, the good memories will be the ones that have stuck. The Goosebumps books were at the entrance to the Children’s Room at the library growing up; you couldn’t help but see them whenever you went it. They were popular, too—very few of the books I loved were ever borrowed by anyone but me (this was back in the day when the patron’s name was written on the card in the back pocket, so you could see a book’s history whenever you picked it up. The nosy neighbor/author in me misses those days, when you could speculate about the other people whose names were on the card, especially if one name cropped up on several of the books you borrowed frequently. “I wonder who that person is,” you could muse. “I bet we’d be friends.” But I digress), but the Goosebumps books were always getting snatched up by kids about my age, and there were always gaping holes in the shelf. Saddened, but not wanting to mess with my nightmares—these were terrible, and plagued me well into my teens, and could be caused by nothing more than seeing a gruesome picture on a tabloid cover in the grocery store check-out line—I bypassed the Goosebumps books and went back to the delights of E. Nesbit, Edward Eager, Lloyd Alexander, and the like. An older friend of mine read and loved the Dark is Rising books, and lent them to me with a caveat that they might be scary in parts. So Dad read them first, and then handed them over to me saying that they did have some dark parts, but that he was pretty sure I could take it, and if I wanted to I could always talk to him about them. In fact, I loved them (as did he, and Susan Cooper remains one of our favorite authors to this day—I bought him King of Shadows for his birthday last year, in fact, and he was just as swept up as he’d ever been in one of her tales. But I digress again). About a year ago, I was desperately trying to find books that Joy would want to read. Excited by her advanced abilities and unduly influenced by memories of the large tomes I enjoyed reading in kindergarten and first grade, I overdid a bit and overwhelmed her. 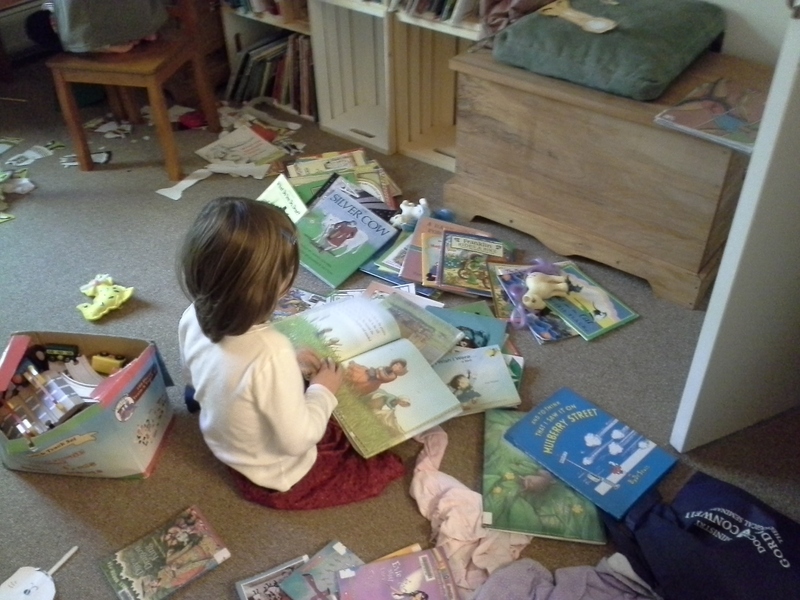 While she was perfectly capable of reading the Little House books, she didn’t enjoy them, and her disillusionment with the “big” books I was giving her spread to reading in general. Then we found the Rainbow Magic books at the library. Pumped out by computer, lame by any standards, they were nonetheless perfect for a six-year-old who enjoyed the thrill of reading “chapter books” but wasn’t ready mentally or emotionally for the themes in most MG writing. Despite the wrinkled noses of many of my friends, I cheerfully borrowed them by the armload each week for her, while at the same time giving her more picture books and other young readers (the Magic Tree House books were another big hit, which has worked out nicely with social studies, I must say—I never know when she’s going to pipe up over something we’re studying, “Oh! Jack and Annie went here.” Digressing again). I’m exceedingly thankful to have had them, especially now when I catch Joy happily curled up with any book from Ladybug Girl to the Frozen novelization to Winnie-the-Pooh to The Lion, the Witch, and the Wardrobe. On the other hand, when this winter the library didn’t have the next one in the series, I deliberately did not suggest ILL or skipping that one to move on to the next. Thus far, she has plenty of other reading material, and she hasn’t seem to miss the Rainbow Magic too badly. There’s a lot of justified complaints about censorship out there. Including and especially parents censoring what their children read. Or what other people’s children read. But sometimes parental guidance gets lost or unfairly shuffled into the same category as censorship, and I think that’s a shame. Because gentle guidance and help with reading—whether it be in limiting the number of certain types of books your kids read, or reading books before letting them read them, or telling them to wait until they are older, or even swallowing your pride to let—even encourage!—them read books that are frankly crap (and then move on when said books have served their purpose), is something that I wish more parents would do. And it’s a far cry from censorship. It is, to be blunt, simply part of what being a parent is all about. Thanks to Maureen, whose tweets on this subject got me thinking about my parents, and how grateful I am to them for the way they encouraged my sister and me to be readers, and then prompted this post. Also, in case anyone is interested, the Little House picture books are well-loved by both Joy and Grace, and went a long way toward piquing Joy’s interest in the real books once she got a little older. 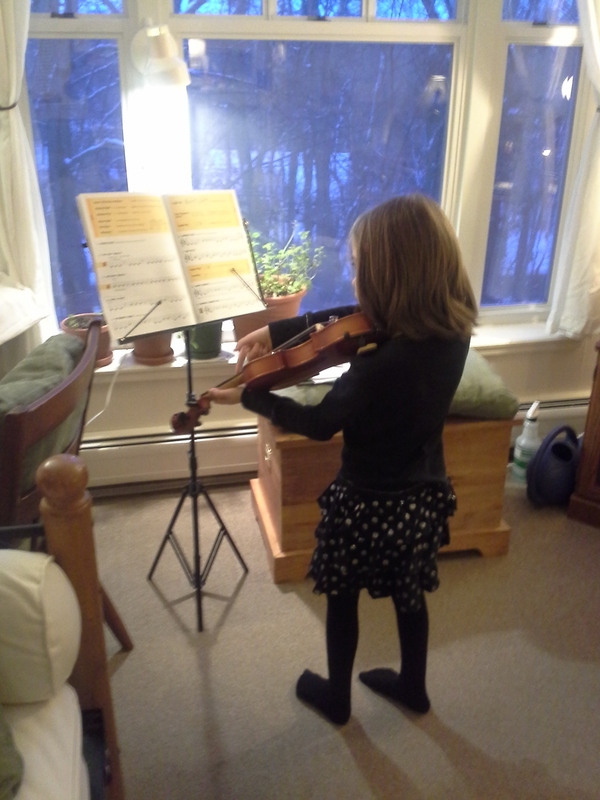 Joy has started “bowing” (which I totally did not know was a word) with the violin, i.e. using the bow on the strings instead of simply plucking them, and thus far, anyway, the screeching has been at a minimum. I am very thankful for this. She is also improvising at the piano again, which means I get to hear a lot of the same three notes played over and over while she tries to figure out the next one. I do my best to endure this with grace, but I confess to occasionally saying “OK THAT’S ENOUGH NEXT SONG PLEASE.” These are the times a larger apartment would be nice. She plays almost every single day, and is at the point now where I rarely have to remind her to practice. 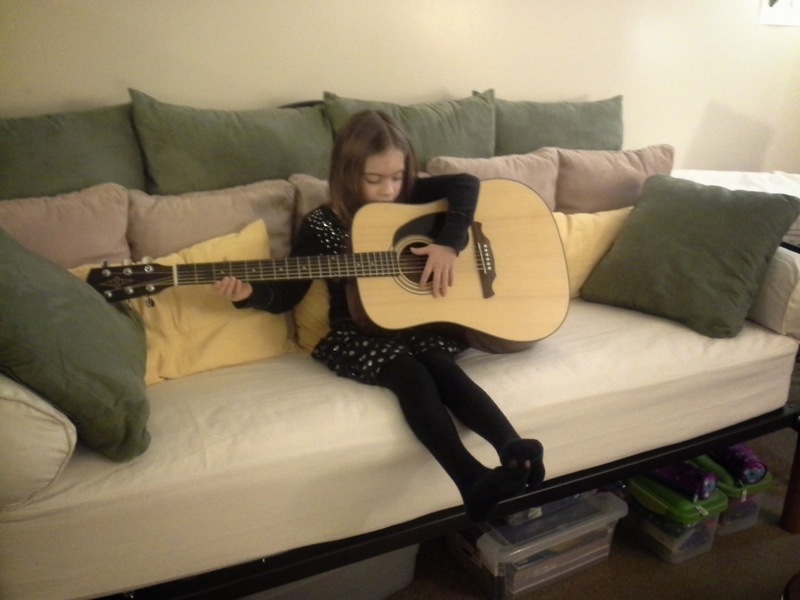 She loves both violin and piano, and usually will ask to play my guitar (which is way too huge for her) after she’s done with her two instruments. She’s also told me she wishes she could take guitar lessons, but I told her we probably ought to stick with just two instruments for now. She has such an instinctive rapport with music. 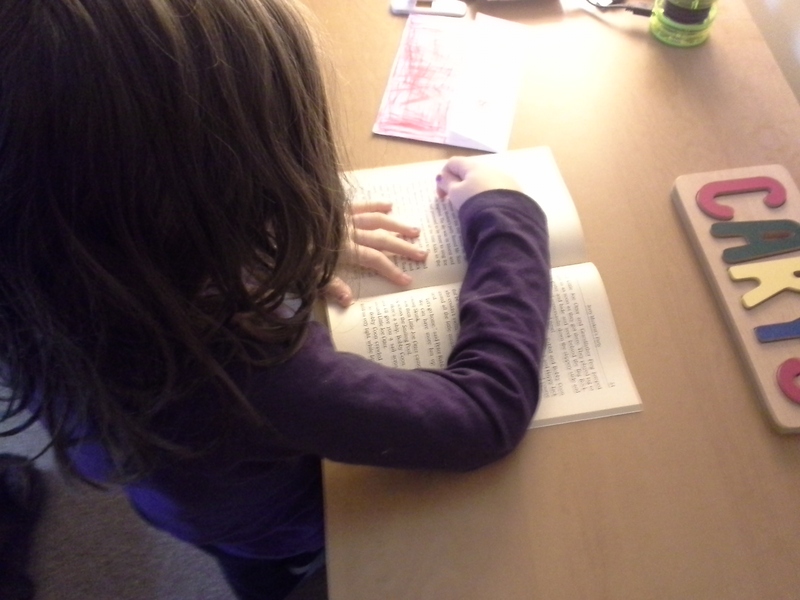 She doesn’t love to read the way I did as a seven-year-old; she’ll happily pick up a book if I suggest it, but she doesn’t usually think to read for herself. I’ll admit that I was concerned by that until I saw how lost she will get in music, making up stories and playing an accompaniment to them on the piano, composing her own little operas without even knowing what she’s doing. She does have a deep connection with and love for story, something Carl and I wanted so much to instill in both our girls. She just expresses it through music more than through the written word. And that is just fine. In fact, it is better than fine: it is a delight. Joy is learning about atoms and molecules in science right now, and hardly a day passes when Carl and I don’t look at each other and say, “Huh. I didn’t know that.” Homeschooling can be pretty awesome, folks. Gracie is finally starting to get the hang of sounding words out properly instead of looking at them as a collection of random letters and wildly guessing at how they’re supposed to go together. Which is also pretty awesome. I suspect, when she finally “gets” it down pat, she will be a reader exceeding even her sister. She loves stories, this girl. I printed out From the Shadows a couple days ago to begin proper edits on it – all 161 pages. Granted, it’s still sitting on my bedside table, waiting for me to begin, but it’s nice having it there, at least. Makes me feel a little more like a proper author. Carl’s classes begin on Monday. This semester is going to be a bit tougher than the last – isn’t that the way of all spring semesters? – but he’s looking forward to it, and I am as well. To be perfectly honest, I’m just eager to get through this semester. Because then we’ll be halfway through, and that is tremendously exciting. I had suggested, back when we started reading through the Chronicles of Narnia, stopping after Voyage of the Dawn Treader (quick note: we read in published order, not chronological order, because both of us feel like you lose half the wonder of The Lion, the Witch, and the Wardrobe upon first read if you’ve already read The Magician’s Nephew, and once you start in published order, you might as well continue). I remembered The Silver Chair, The Magician’s Nephew, and The Last Battle all being slightly dark/heavy/creepy in places. It might not be a problem for Joy, but Gracie tends to have problems with nightmares as is, and she is, after all, only five. Carl was not convinced, and by the time they’d made it through Prince Caspian all three were gung-ho to go through the entire series all at once. I subsided. They are now almost finished with The Silver Chair, and Carl has decided that after The Horse and His Boy, they will wait a few months to a year to finish the series. I only said “I told you so” once, which I think shows great restrain on my part. I am not doing so great on my goal of reading one non-fiction book a month, but I have started reading a commentary on 1 Peter, which even if it takes me six months to finish will be well worth six shorter books. I also have the first collection of Dorothy L Sayers’ letters now sitting on my shelf, and I can’t wait to start perusing those (my parents gave me an Amazon gift card for Christmas, and that was top of my list to buy with it). The last few days, though, I confess to re-reading Tey, Marsh, and Christie. My brain’s been too worn out from school with the kids to tackle anything new, even light fiction. I’m starting to get annoyed with all the detectives, though – Grant, Alleyn, and Poirot alike – so it might be time to give them a break. I have been getting in a good-ish walk once a week the last couple weeks, thanks to Joy’s violin lessons. We walk the 1/4 mile to her teacher’s apartment and then back, going at a good brisk clip. It’s lovely, and it’s encouraging me to try to get out more than just once a week for a walk. The tricky thing is finding the time, between school and housework and cooking and writing and simply needing to make sure the children don’t take a hundred years to do their basic chores. Ah well. I’ll get it figured out at some point. I’m just thankful for being forced to walk at least once a week. It’s so much better than nothing. Also better than nothing is blogging little snippets here and there. If I go too long on here without writing anything, I start to get lonely. Even if the majority of my social media interactions are done on Twitter these days.